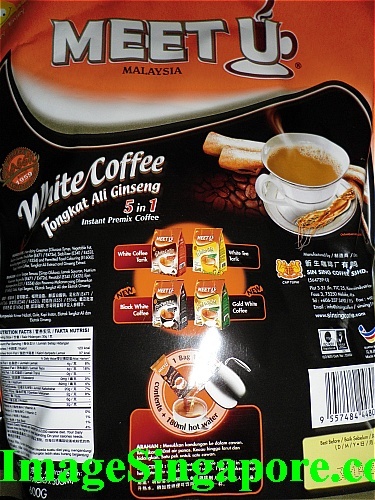 I saw this 5 in 1 coffee that was on sale while I was in Melaka, Malaysia. I have seen 4 in 1 coffee; but 5 in 1 coffee is something refreshing to me. The brand is Meet U and printed on the pack was that it contained 20 stick packs of 30gm coffee. The 5 ingredients that made up this coffee are 1) White Coffee 2) Tongkat Ali extract 3 ) Ginseng extract 4) Sugar 5) Non diary creamer. And the instruction was to pour all the contents into a cup and add 180ml to enjoy a delicious cup of coffee. 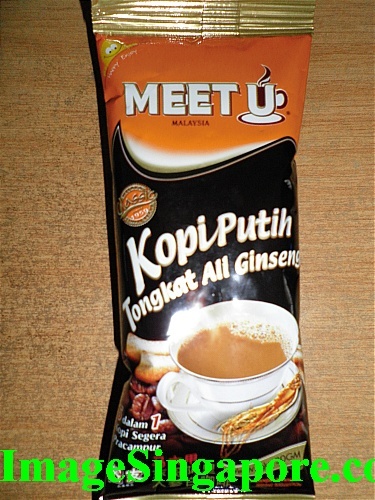 This coffee is manufactured in Melaka, Malaysia. So I decided to buy this coffee and bring it back home to try out the taste. Tongkat Ali herbs is commonly consumed in Asia by men who want to enhance their sexual performance and to improve their health. It is almost perceived to be liked Viagra in Malaysia and Indonesia. And Ginseng is a health tonic that improves our health and vitality. But I guess the amount of Tongkat Ali and Ginseng added onto this coffee should be very marginal to have any significant impact on our body. So I don’t expect any enhancement in my overall well being after drinking this coffee. After adding hot boiling water into the coffee cup, I could smell the strong aroma of coffee emitting from the cup. I stirred it thoroughly to make sure that the contents are properly dissolved. 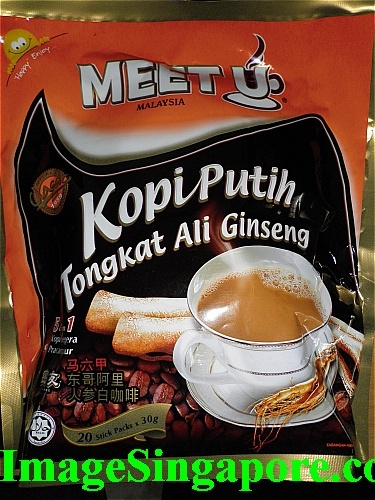 My verdict is that the 5 in 1 Tongkat Ali with Ginseng coffee taste good. It is not too sweet nor was there any strange taste of herbs in it. In fact, it tasted just liked the normal instant coffee. But the taste and smell was nice and it is quite creamy too. I told my friend that I felt no special effect or POWER on my body after drinking it. No increased in sexual desire, no extra vitality or strength – just as I expected. But I do feel more alert and less sleepy. I normally take a short nap in the afternoon; but after drinking this coffee – I was alert throughout the whole afternoon. Anyway it is a nice cup of coffee, do buy a pack and try it out if it is available in your country.